I booked a Petra Day Trip from Eilat. I thought about to go there by myself, but Henry, an American Jew studying history at UCLA and my roommate at Megiddo excavation, told me not to. He did his own trip to Petra. After the border, he had to get a cab to Petra, which is 2 and half hour driving. And it is painful and also almost impossible to negotiate with the local taxi drivers. And the Petra entrance fee is very expensive. But he told me it may be cheaper to use tour service, and obviously much easier and comfortable. 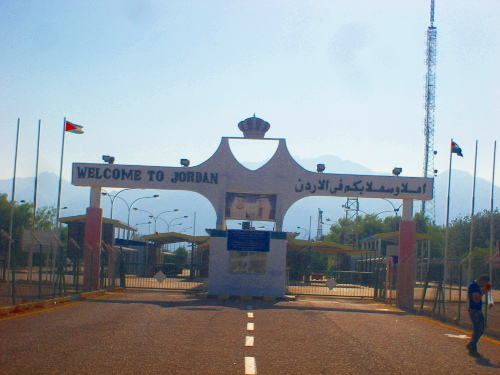 King of Jordan welcomes you! Jordan is a kingdom. I had tour with two other girls from Mexico. They said they are sisters, but they do not look alike at all. The older looks like a Mexican with quite dark skin tone, while the other looks like a European. They said their mother is a Mexican and their father is a Jew. I still remember how many people were at the Taba border, and how chaotic it was. But today, we three were all at the Israel-Jordan border. Going out of Israel was no problem as it was at Taba too. 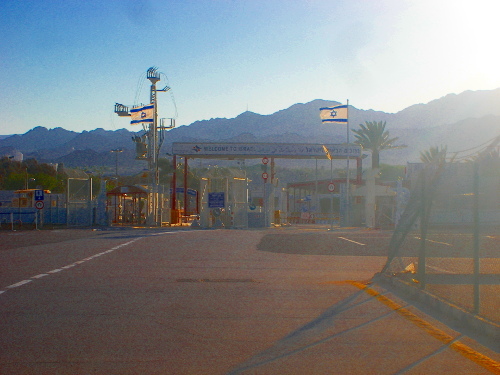 Jordanian border was easy too. There was a guy from the tour office, and he took our passports and did all the job while we were drinking coffee. 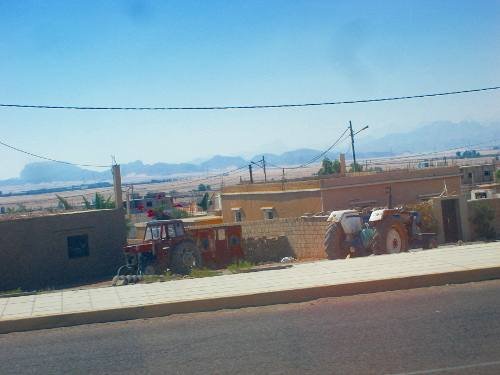 This is a Bedouin village. In Arabic Bedou is traveller, and -in is plural suffix such as -im in Hebrew. So Bedouin means travellers. But some of them settled, and they have villages. If you look carefully, you would see the second floor is under construction. They do not have actual desire to build the second floor. They just need the ground floor. But unless the building is complete, they do not pay any tax. That is why they just began the second floor construction, and never continue building it. 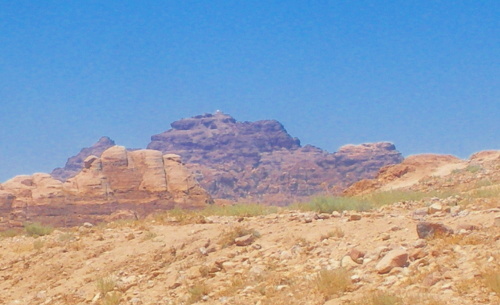 After two and half hours driving, we went to the Petra. 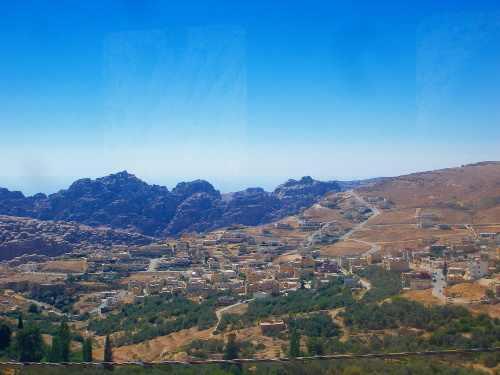 The white dot on the mountain top of the photo above is a mosque commemorate the death place of Aaron, the high priest and brother of Moses. 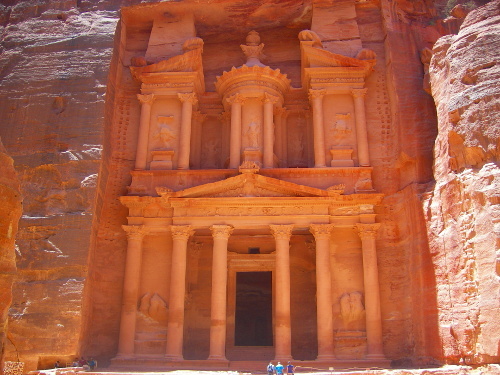 The entrance fee to the Petra is about $130, which is crazy expensive. The entrance fees to the archaeological parks in Israel is around or less than $20. 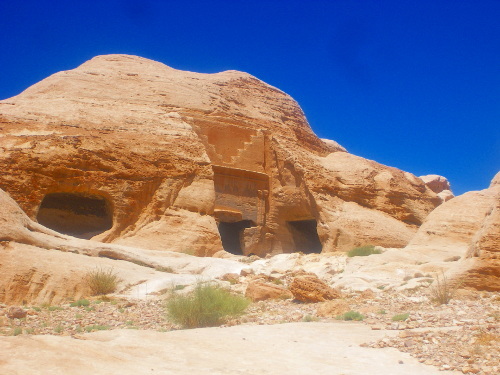 Some caves has a decoration above it in the shape of stairs. That indicates the cave is burial cave. The stairs are to heaven, the ancient people thought. 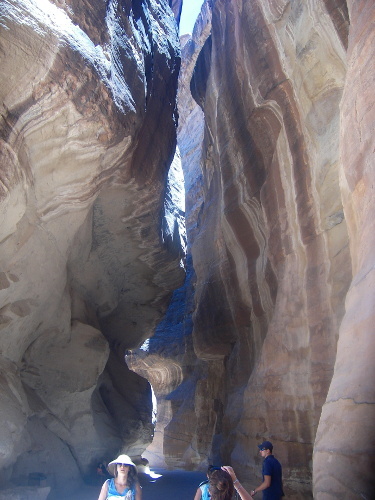 This is the siq, the gate to Petra. This is very long and wound channel. It is very amazing, and there are two aqueducts on both sides. Left one is for the animals to drink, and the right side is for people to drink. After the long walk, you begin to see the greatness in the small crack of the channel. And finally when you come out of the channel, the awe-ness reveals itself. We see the two stories, but actually it is three stories. 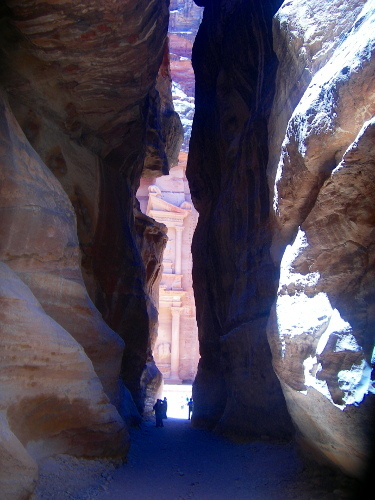 The earthquake in Roman times destroyed most of the cities and three-quarters of Petra was buried. The tour guide said that the ground now is 20 feet (6 m) higher than the original ground. The true amazing thing is that almost everything was not built but carved. They just carved the stone and huge rock. Tourism Police – To Protect and To Serve who? 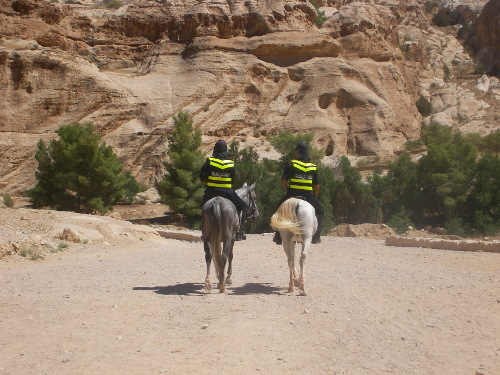 We spent almost four hours in Petra. This is huge city, even they have a theatre, but still not built but carved. There were several tourism police but I was told that the tourism police is not to protect the tourist but to protect the merchants. So you’d better not to engage any argument with the merchants. I wonder why there are so many people in Egyptian border while there is no one in Jordanian border.